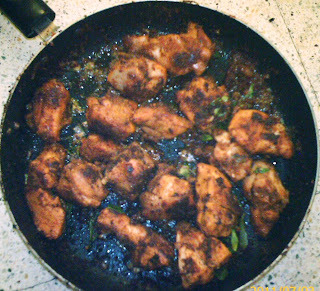 Chicken shallow fry is prepared with very less oil in a non stick fry pan and tastes similar to chicken 65. This shallow fried chicken will be suitable for the people who want to avoid deep frying. A treat for this Christmas with oil less Chicken fry. This chicken fry is not available in any restaurants and hotel in India. Try this oil less chicken shallow fry recipe at home and Enjoy Cooking!!! 1. Mix corn flour, red chilli powder and salt. 2. Add ginger garlic paste and mix well. 3. Add egg, lemon juice and mix well till it becomes like a jelly paste. 4. Add chicken pieces to the above marinade and mix well. 6. Then Shallow fry the marinated chicken in a non stick fry pan in a slow flame till it is well cooked.